Snooze, swim, Singha’s, shop, supper, shop, swim, sleep … until Sunday which was Day 9 of out trip. Today was Sunday and was designated as our rest day from all the hard work of holidaying in Thailand that we had done! Today was also the hottest of our entire trip – high of 36oC and low of 29oC! It was a windless day with humidity close to 90%! It was an ideal day for staying in the water – be it the hotel pool or the Andaman Sea at Patong Beach. The only problem is that sometimes you actually need cool water to swim in, because even the sea and pool water become too warm! Thank God for air-conditioning – on what day did He create that?! So, after breakfast, we headed for the pool and the beach and the sea. 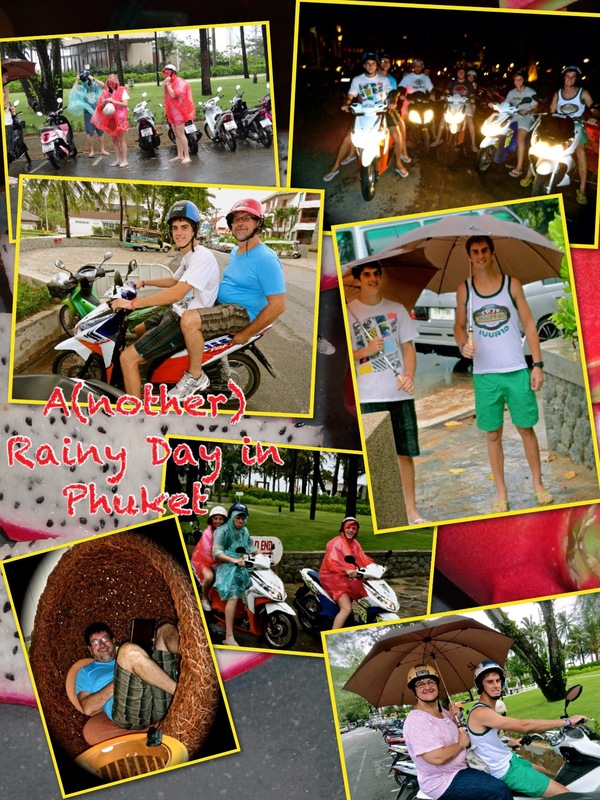 We strolled, swam, Singha’d and snoozed … and shopped! 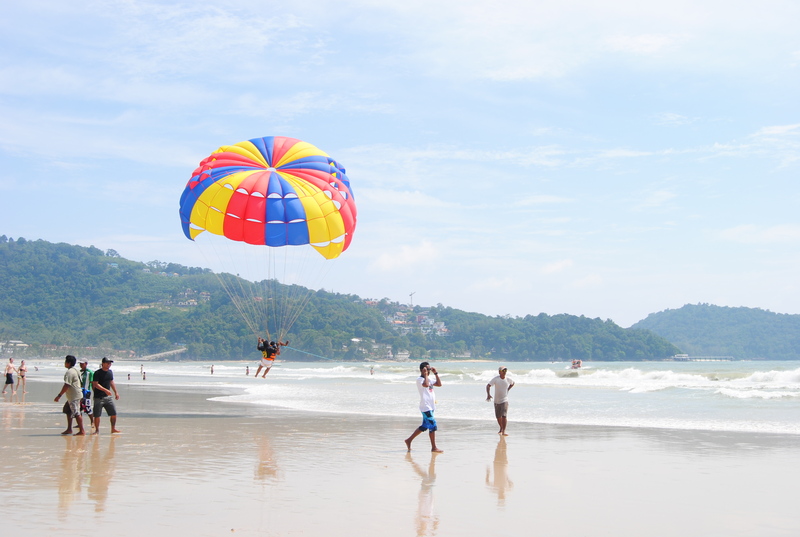 On Patong Beach there are all kinds of activities (for negotiable rental, of course! ): loungers for snoozing, jet ski’s, parasailing, ski-ing, boating, Thai Massages, manicures, pedicures or just ordinary swimming (rent-free!) and, of course, shops – at which Pera bought pearls and the ladies organised tickets which would take us on a boat trip to Phi-Phi Island on Monday! There is so much boating activity at Patong Beach that one could actually taste the petrol/diesel in the water! Paradise won – Paradise lost! We slothed our way through the day – until it was supper time once again, and we headed back to Subai Subai for our daily dose of excellent, inexpensive Thai food and great hospitality. 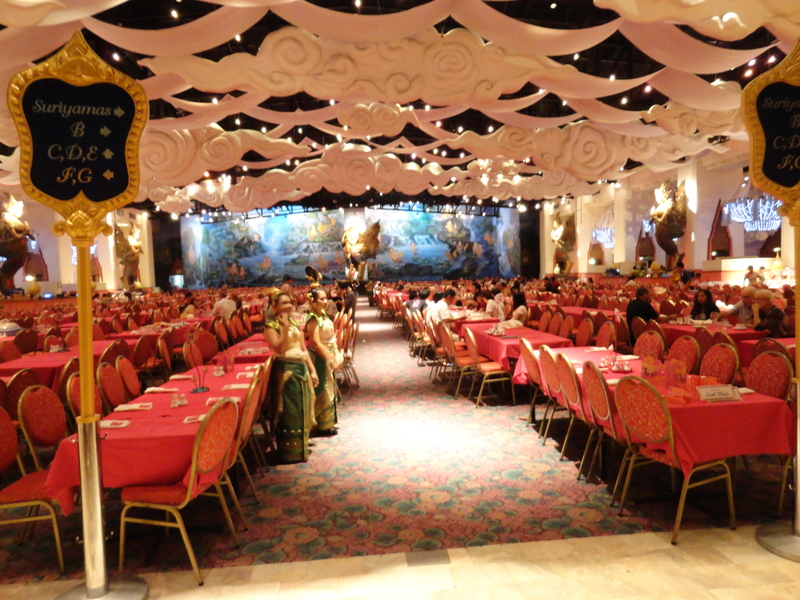 So busy are they that we had to wait for a table – but, never-mind, until then there are … you guessed it …. more shops to peruse! We walked back to our hotel, and on the way there, we stopped for lovely caramel and cream pancakes sold on the kerb by one of the (many!) 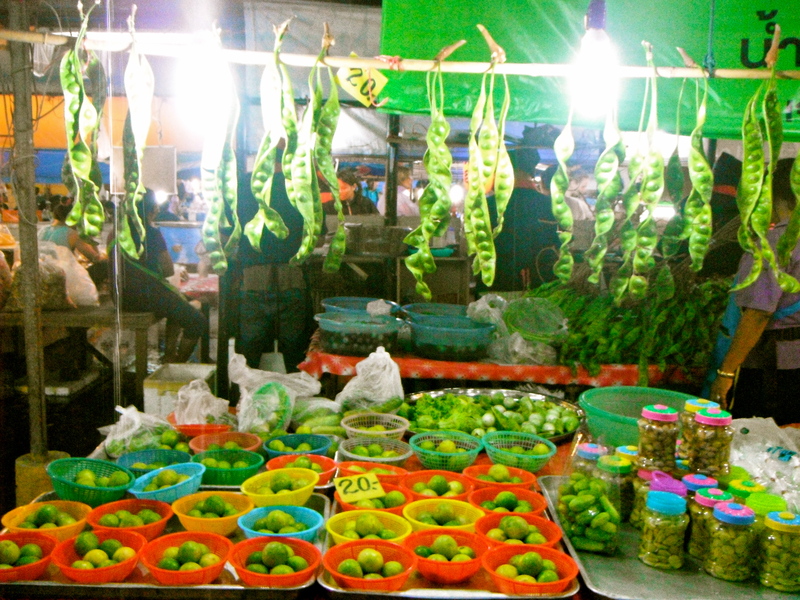 street vendors. As usual, the nightly routine was a late-night swim before a well-deserved sleep. Saturday would be another early morning for our island tour. Breakfast and ready by nine. It’s quite a thing to get up early when you start getting used to late sleep-ins! Anyway, the tour guide was typically punctual (quite something for us Africans) and we all piled in – me in the front as usual. My numerous questions posed to the driver were always laughed at by the rest of the group. Hopefully, not because of the poor questions posed but always because of the poor understanding of English by the driver. (Thai’s generally understand and speak English very poorly and, of course, we understand and speak no Thai – a recipe for frustration!) So all my questions usually had poor responses, if any at all! Political responses, I call them, the type where the answer in no way matches the question posed! Eventually, I just gave up asking questions and took in and savoured all that was to be seen. We headed south from Patong Beach down the west coast of Phuket, passing Karon Beach, Kata Beach and Kata Noi Beach (noi meaning small, so that’s “small” Kata Beach where we would be moving to next Tuesday). That’s about a 20km winding up-and-down trip. From the Kata 3-Bay viewpoint you are able to look north and see all three stunning beaches in one view. Photo time! After more photo’s, we continued northwards along the eastern seaboard of Phuket towards Phuket Town (or City as it’s also called!) – the main town on the Island. Before that we headed upwards (literally up Mount Nakkerd) to the Big Buddha, well known among Thais as the Phra Puttamingmongkol Eaknakakeeree! 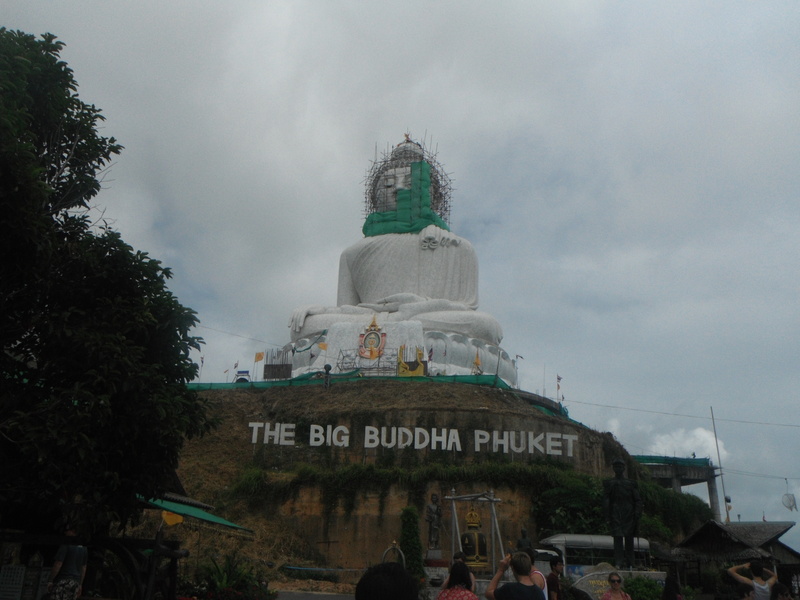 The 45 metre high Buddha is 25metres across its base, layered with beautiful white jade marble and sits and shines in the sun on top of the mount between Chalong and Kata. 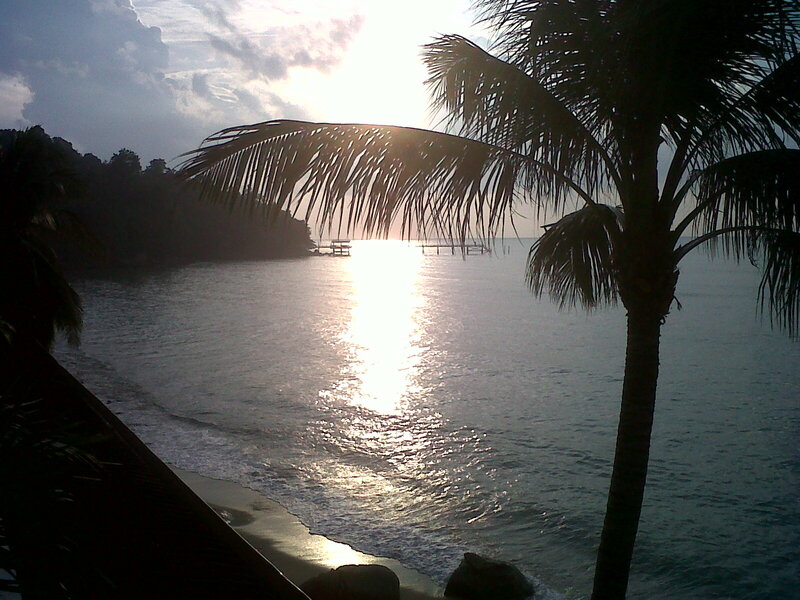 It can be seen from far away and from it one has the best 360 views of the entire Phuket Island. More and more photo’s! 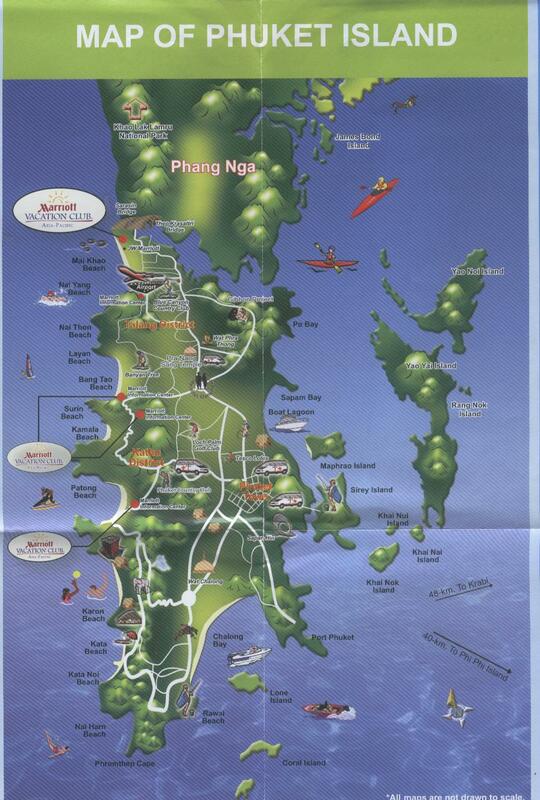 The Bryants and our boys got off at the Burger King, and Pera and I did a clockwise trip north along the one-way Thaweewong Road (Beach Road) and south on Rat-u-Thit 200 Road, arriving back to our Amari Coral Hotel just after one pm. On Friday morning, we were to meet our tour operator from World Travel Services, Mr Pombat, at 11h00 in the “over-looking Patong Bay” foyer of our hotel. So, it was breakfast at ten. Then we met to confirm the arrangements for our trip back and to discuss any other tours that we would want to do whilst on Phuket. There are a myriad of tours available and the prices – like everything else here – are negotiable! We tend to think that if anything is cheap then there must be a catch to it. But I guess the price of whatever you buy here in the line of tours and excursions is directly linked to what you get: the cheaper the price, the less you get and, of course, vice versa! The more you pay, the more frills and fancies are attached to the excursion. 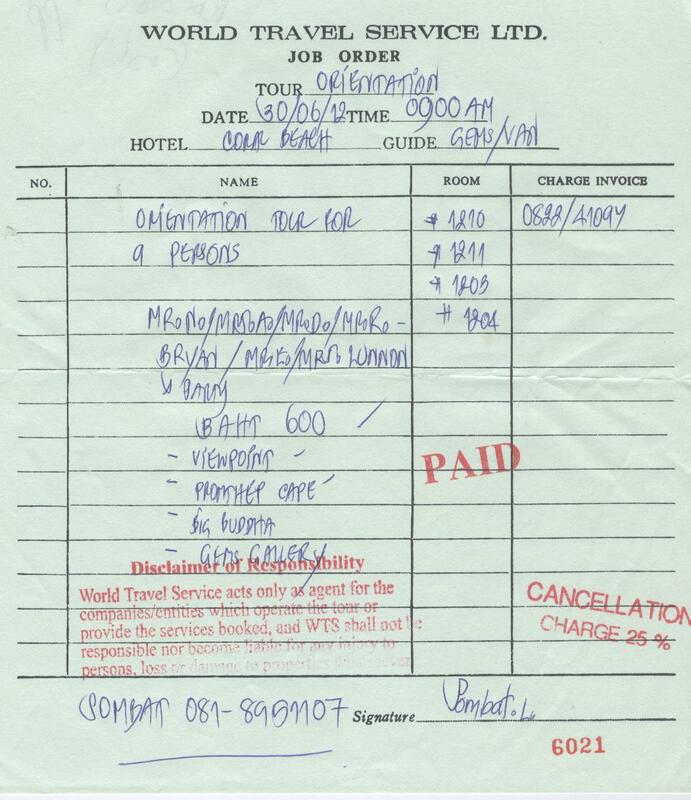 We agreed and paid to do an orientation island tour at 09h00 on Saturday morning – BHT600 for all nine of us. Atrip to the famous Phi Phi Islands would cost (negotiable, of course!) BHT 2580 cash(!) per person. For the rest – we got the run-down, got the pamphlets, took the names and the numbers, would consider our options and get back to them in due course. Of course, that simply meant that we would see if we could get it any cheaper elsewhere, bearing in mind that excursions are offered on sale along with every street vendor and on every other street corner! 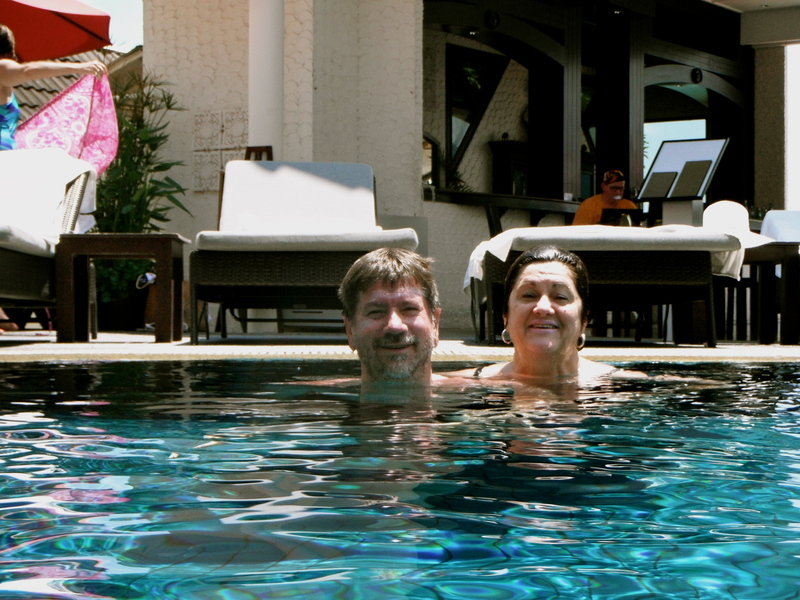 But now it was swim time in the hotel pool, and in the Andaman Sea! 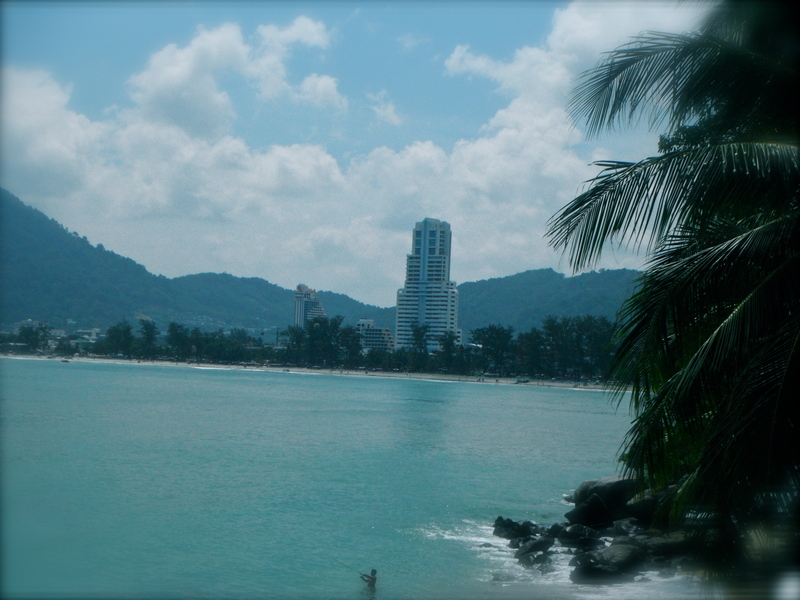 Then some walked from the hotel along Patong Beach and back. A snooze for us followed, whilst the rest “kuiered”. 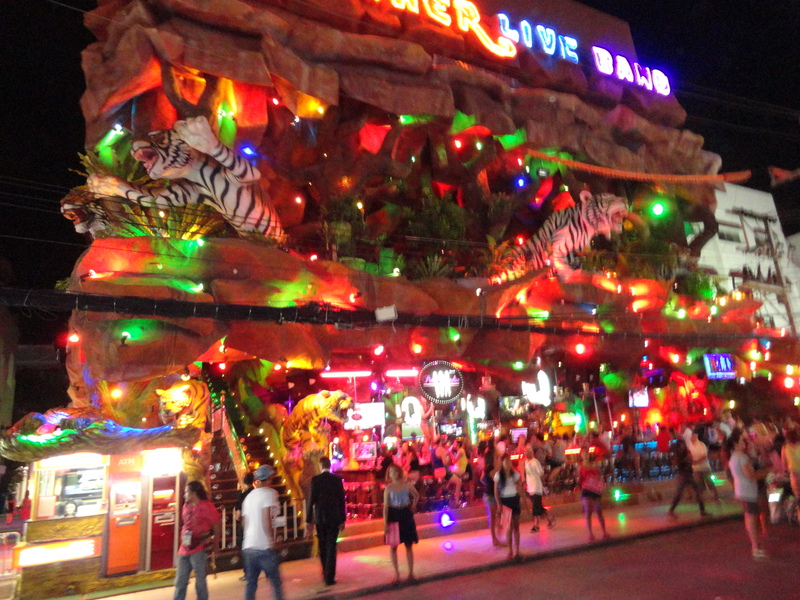 We were scheduled to meet in Patong Town for supper at 19h00. My usual radar device went faulty and we took the wrong turn, so we were hot and sticky and late by the time we met up! Shop, ‘squabbling’ supper and a show followed (suggested to us by Joggie Viljoen, ex-Grey boy and Stormers rugby player – now in New Zealand – who was eating at a table behind us and came and introduced himself). 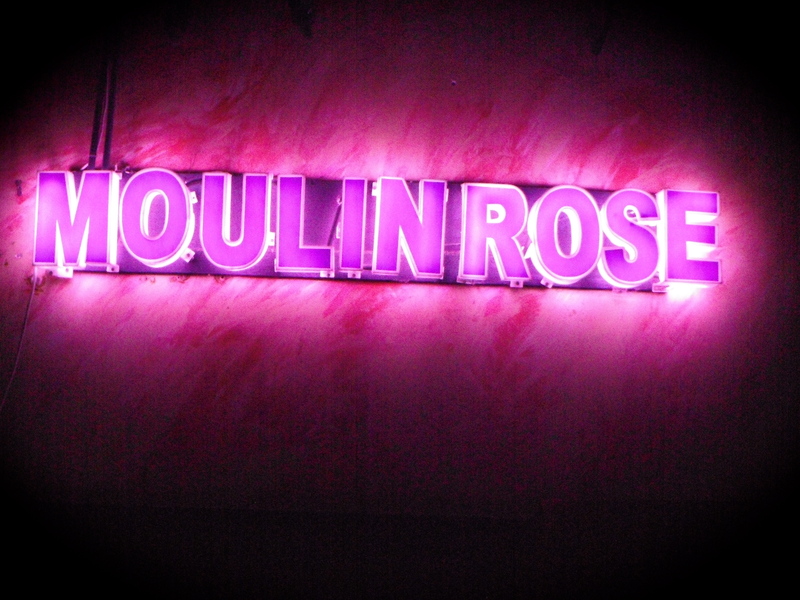 The show – Moulin Rose – was on the street where everyone lives in Patong, Bangla Road. A normal vehicular thoroughfare by day and a pedestrian precinct, a theatre land, pub land and entertainment centre by night – a seething mass of people who have come to see and to be seen. Young and old, young and young, old and old, and in many cases old Westerner male and young Thai female – all coming in search of Paradise, whatever Paradise may be for them! The show was enjoyable and far sexier than the one seen in Bangkok. It was a musical revue and the actresses all actors – a bevy of lady-boy beauties lined up on stage, off stage and afterwards – at a price – for photos and whatever else the heart desires. … Beach Road, Patong, lead us not into temptation but straight back to the Amari Coral Hotel at the southern end of Patong Beach on the Island of Phuket in the Kingdom of Thailand! It WAS already Thursday morning when I put my head down on the pillow. We would have to get up earlier this morning, as later on Thursday we were flying to Phuket and needed to get to the airport. I was first up and had breakfast by myself! The rest were either sleeping in, still cross with me or shopping! At 09h30 we all met in the hotel foyer and waited on our taxi’s to arrive to transfer us to the Bangkok International Airport. There we checked in, explored the airport, and awaited our Thai Airlines Airbus A330 Flight TG211 to Phuket International Airport due to leave at 12h15. I found myself considering this strange breed of people in transit that, at any given time occupy airports and aeroplanes all over the world. A seething mass of humanity on the move – either on the ground locked into airport buildings or in the air locked into large tin cans traversing the skies over our wonderful world. Maybe, sometime I’ll write about the “Travelling Willbury’s”! It was a short flight of 1 hour and twenty minutes, partly over the Thai Peninsula and some of it over the Gulf of Thailand. 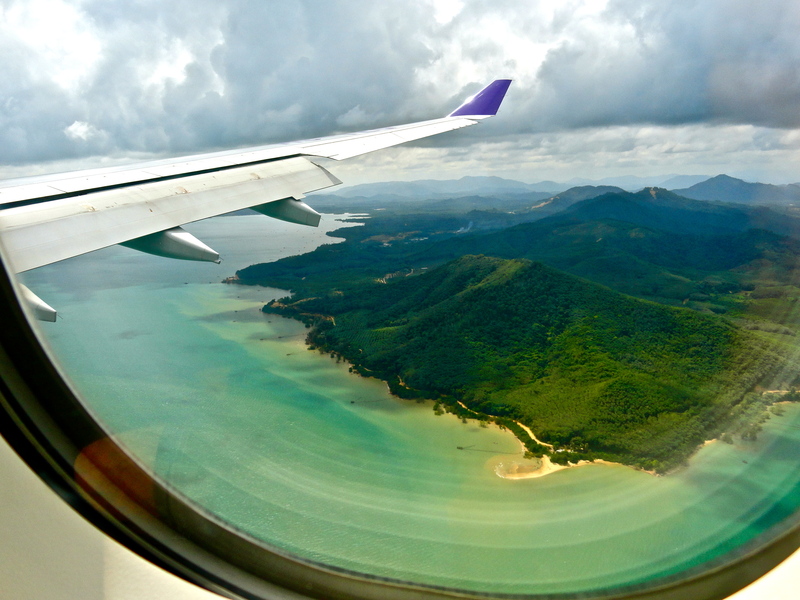 Very soon, I could see the bluish-green sea and the white beaches of the Island of Phuket (and even the causeway bridge that connects Phuket with the Thai peninsula mainland). The camera snapped away as we came in to land from east to west. You come in over the sea on the western side of the island, see the water, see the beach, see the runway, touchdown, brakes … and by the time you get to the end of the runway you see the beach and sea on the western side of the island! Phuket International is a smallish airport, and as it was a domestic flight for us, we did not have to proceed through customs and passport control. We collected our luggage, and were met outside the front door by our taxi driver to the hotel. The sign said LUNNON and it’s always reassuring to see your name and someone waiting for you! Almost an hour long trip followed to Patong Beach and to our home for the next five nights – the Amari Coral Hotel situated on and overlooking the southern side of Patong Beach and Patong Bay. We checked in, received our welcoming drink and our cold “lappie”(facecloth) to wipe down the face and leave on the back of your neck to cool down, and then went to our beautiful Andaman sea-facing rooms, with the waves lapping right below our balconies. 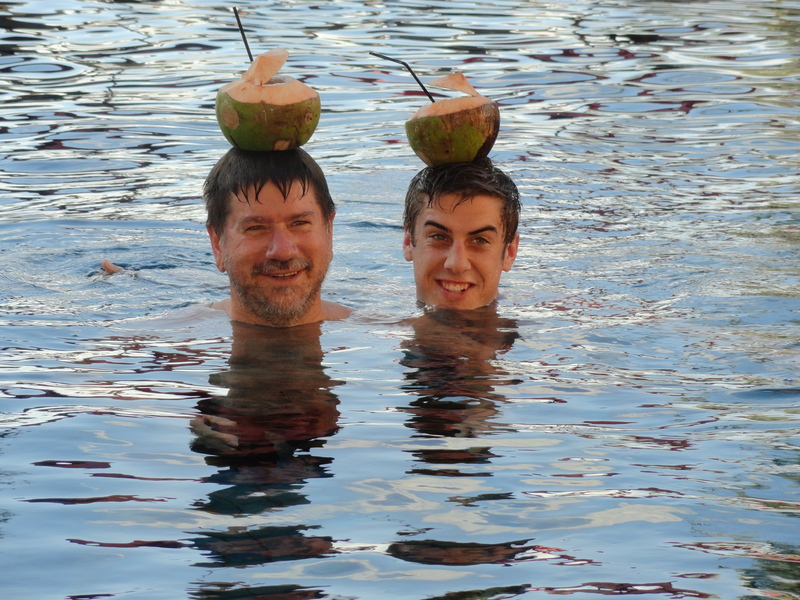 But no time for that – we headed straight for the hotel’s pool, happy hour and our first exotic tropical Island style cocktail cocorico drink served in a coconut in the pool. Heaven could not be better than this. A few hours later, we left the pool, changed and headed into Patong “City” to see the sights and to find supper. The tuk-tuk dropped us off at the famous Bangla Road. From there, we explored until we were “spotted” and stopped by a friendly South African couple who advised us to dine at a little Thai restaurant called Sabai Sabai (Thai meaning “all is good and well”). We would return there often, as the food was good, the atmosphere great and the prices very inexpensive – yes, all was good and well! SA and Aussie business cards, messages, names and signatures adorn the walls! After supper, just a bit more scouting, shopping (! 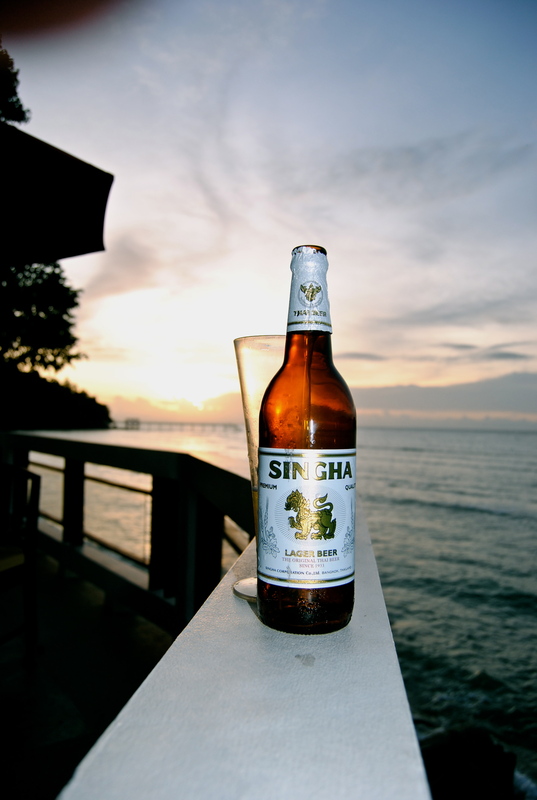 ), and snorting (Singha’s) – until it was time for me to call it a night. I walked up the steep hill back to the Amari, had the obligatory midnight swim (it was 28 degrees and the water not much cooler!) and then dozed off to sleep in my lovely air-conditioned room at 17 degrees with the sound of the waves crashing on the beach below..
On Friday morning, we were to meet our tour operator at 11h00 in the “over-looking Patong Bay” foyer of our hotel.